Fire doors are an irreplaceable necessity in most buildings. As part of a passive fire suppression system, they are responsible for keeping flames, fumes and smoke contained so they can’t spread into other sections of a building. Made from layers of steel, wood, vermiculite and wire mesh glass and other durable materials, they are rated based on their ability to withstand damage from fire. Doors that divide smaller areas usually have lower ratings. Those that are rated below 1.5 hours are ideal for occupancy areas. On the other hand, 20-minute fire doors are typically used to divide hallways. 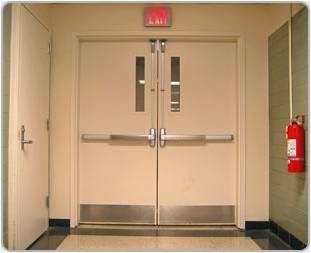 Since most fire doors come with fire-resistant windows, they allow occupants to see through the other side and determine if it is still safe to pass through. Fire door manufacturers must always make sure that their products are in good working order. Similar to industrial roller shutter doors, they need to undergo extensive testing before being released on the market. Everything from the intricacies of the ironmongery to the essential frames and seals are thoroughly examined and assessed to ensure their functionality, durability and reliability. Simply put, the primary function of fire doors is to prevent fire from spreading into other sections of a building. They protect escape routes from heat and smoke so occupants can safely leave. At the same time, they can aid fire fighters and other rescue personnel. By keeping flames contained, they give them ample time to find their way into the building, extinguish flames and rescue occupants. Because of this, they need to be able to close and seal by themselves at all times. Propping them open is strongly discouraged since this disrupts its effectiveness at preventing flames, fumes and smoke from spreading. It is important to remember that fire doors can only provide utmost protection if they are used properly. Be sure not to leave them open so that they can do what they are meant to, in an emergency. Of course, some types of fire doors have an electromagnetic mechanism that can hold the door so you do not have to prop it open yourself. It immediately stops and releases the door whenever the fire alarm is activated. As a responsible occupant, you must make smart decisions and do your best to prevent fire-related mishaps. Use your building’s fire doors properly, follow proper fire safety practices, and do not forget to check out our safety tips for kitchen fire prevention.